The latest HomePlug adaptors from devolo allow freesat users to access internet TV services such as BBC iPlayer through their television by connecting up their freesat digital box or freesat TV. Created to work specifically with freesat receivers, the dLAN 200 AVpass (freesat) kit allows users to connect any enabled freesat digital box to their home broadband router through use of the household electricity network and can deliver data speeds of up to 200 Mbit/s. Once the adapters are connected, you can use the red button to select the IPTV services, such as BBC iPlayer. 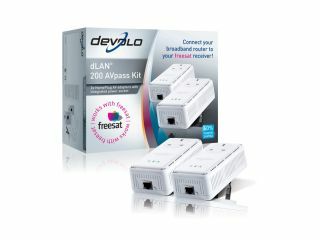 The dLAN 200 AVpass (freesat) kit is one of the latest additions to the devolo range of dLAN networking products and are now available at stores including Argos, PC World, Comet, Currys and Maplin Electronics. We have three packs of the dLAN 200 AV (freesat) kit worth £119.99 each to give away. This competition is now closed. The winners are Sarah Barraclough, David Sabharwal and Mark Ottaway.